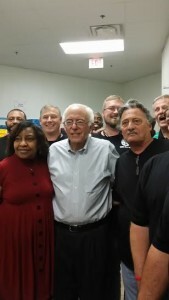 APN Endorses Bernie Sanders for President of the U.S.
(APN) ATLANTA — The Atlanta Progressive News Board of Directors endorses U.S. Sen. Bernie Sanders (I-VT) for the Democratic nomination for President of the U.S.
APN declines to endorse a candidate for the Republican nomination. Sanders has been an advocate for poor and homeless people, for tackling wealth and income inequality, for civil liberties, for peace, and for many other progressive causes. He has been a consistent and principled leader, and is exactly the type of person APN is looking for in a candidate. While then-U.S. Sen. Hillary Clinton (D-NY) supported the Patriot Act, then-U.S. Rep. Sanders voted no. While then-U.S. Sen. Clinton voted to authorize the U.S. Invasion of Iraq, then-U.S. Rep. Sanders voted no. Sanders was also a very effective legislator, forcing many bipartisan and common sense amendments to legislation while in the U.S. House. And Sanders being an independent, as opposed to a partisan Democrat, makes his candidacy even more attractive. Former U.S. Secretary of State Hillary Clinton, to be sure, has a progressive platform: she is seeking a massive investment in solar panels; an amendment to the Constitution of the U.S. to clarify the ability of U.S. Congress to regulate campaign finance; a public campaign financing system; automatic voter registration in federal elections; a $12 federal minimum wage; and many other things that are consistent with APN’s editorial and policy priorities. However, Clinton’s more moderate voting record raises our concerns about whether she will deliver on a progressive agenda today. In addition, Clinton’s acceptance of campaign contributions from corporate donors, while Sanders has refused to accept corporate donations, raises more concerns about to whom she will be beholden. We are truly excited about the energy that young people especially seem to have about U.S. Sen. Sanders and hope that it is a signal that the electorate has shifted greatly over the last ten years, so that we may achieve the progressive policies, like true universal health care, that we need to bring the U.S. in line with the rest of the world’s industrialized nations. Thank you for your Bernie endorsement. The corruption in congress threatens our democracy, and sadly countless numbers of Americans do not see this. Bernie is the voice calling for fundamental change. Thank goodness for Bernie. Thanks again to APN. Thank you for reminding the voting public that integrity and grassroots are still part of our election framework. Exciting to see your strong advocacy in the heart of the deep South. When we all stand together, there is nothing we cannot accomplish! Thank You for Endorsing Mr. Sanders . He is what we’ve needed, And That Is, To help all Americans! Thank you for recognizing a truly unique candidate!! The tides are changing and more people are waking up… your support truly helps!